Camille A. Brown and Dancers; 03/03-04/2015 *NEW DATES! Camille A. Brown is a prolific choreographer who has earned multiple accolades and awards for her daring works. Her latest work, BLACK GIRL: Linguistic Play, is a multimedia depiction of the complexities of carving out a positive identity as a black female in urban American culture. Combining history and musicology with fantastical imagery from Alice in Wonderland, this work offers a grand narrative reflecting on feminism, patriarchy, and how women navigate within this world. Middlebury’s performances during women’s history month also includes works by three additional female choreographers. Sponsored by the Performing Arts Series, Dance Program, and Committee on the Arts. Camille A. Brown and Dancers is a recipient of the New England Foundation for the Arts’ National Dance Project Touring Award, with lead funding from the Doris Duke Charitable Foundation and the Andrew W. Mellon Foundation. *Due to artist obligations, this production has been moved from the previously announced March 17-18 slot. Please join us in congratulating Camille on being named a 2015 TED Fellow! Camille A. Brown's Mr. TOL E. RAncE "reel talk"
Johari Mayfield pulls from her Double Dutch beginnings to her work in the Limon technique, African dance, ballet, and digital media to develop a style that uses seemingly disparate ideas, movements, cultures, narratives, and music forms to creatively tell compelling stories. As a performer, Ms. Mayfield has worked with many companies, including Forces of Nature Dance Theatre and Peggy Choy Dance Company. She’s done it all—from being a Voudoun priestess, to carrying Christmas packages as a Disney character at Radio City Music Hall, to dodging explosives in a post modern “Porgy and Bess.” Her choreographic vision is to create socially significant work (The Venus Riff, hOMe, L’enfermee, and Water Lily) that encourages audiences to reflect upon the experiences of women, both past and present, that are frequently unexplored in mainstream performance. 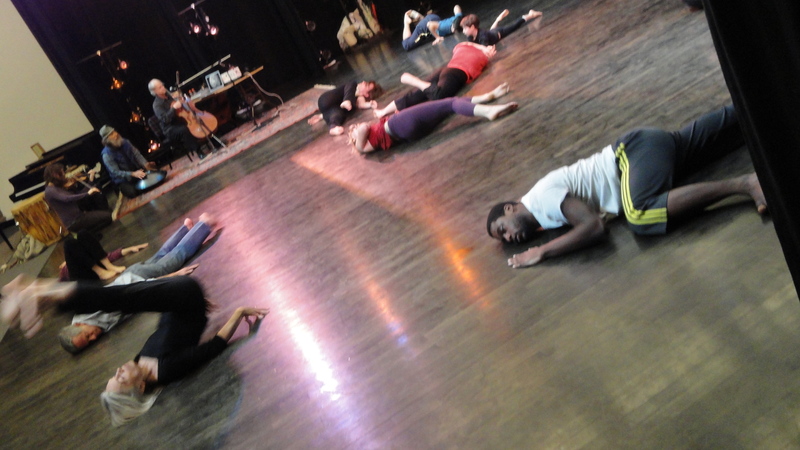 Ms. Mayfield’s work has been presented at several different venues, including HERE Arts Center, The Gatehouse at Aaron Davis Hall, 45 Bleecker Theater, and Dance Theatre Workshop (now New York Live Arts). Afaliah Tribune is a graduate of Ohio State University with a B.F.A in Dance, and studied/trained with Mrs. China White, former principal dancer of Dance Theater of Harlem. Ms. Tribune has performed and toured with Rennie Harris Puremovement, Bebe Miller, Andrea Woods, and Philip Hamilton’s VOICES. She has also been featured on television specials for MTV, Comedy Central, and BET Networks. Also an accomplished singer and songwriter, Ms. Tribune has penned songs for CBS soap opera “Guiding Light” and for several advertising campaigns. Brooklyn-based Afaliah Tribune/SoulRebel Dance is a contemporary modern dance company that infuses Hip Hop, House, and West African dance forms. As a choreographer, rapper, singer, and songwriter, Ms. Tribune uses her various artistic skills and interests to create a marriage between movement and music in a way that speaks largely to the urban experience. Ashley Chavonne is a performing and teaching artist based in New York City. She received her early dance training in ballet, jazz, modern, and techniques of the African diaspora in Detroit, MI. She continued her studies at Ohio State University, where she had the pleasure to work with Bebe Miller, Kathleen Hermesdorf, Rennie Harris, and a number of other notable choreographers. She has worked with Detroit Dance Collective as a featured performer and teaching artist, NYC based company Jazz Ain’t Dead as a featured artist, and Jana Hicks, Marijke Eliasberg, and The Next Stage Project as a guest artist. Ms. Chavonne is currently a performing and teaching artist for the Treehouse Shakers Dance Theater Company, a trainee with Nimbus Dance Works, and continues freelance work with other choreographers in Brooklyn and NYC. Follow her around the city and abroad @ashvonne on instagram and Twitter. Latoya Hall began studying West African Dance in 2002 under the tutelage of Esther Grant-Walker, Sewaa Codrington, Sandella Malloy, and Mouminatou Camara. She has performed at various venues, such as Brooklyn Academy of Music’s Dance Africa, The International African Arts Festival, New Jersey Arts Festivals, Khamit Festivals, Bronx Zoo, Syracuse State Fair, Lincoln University, Columbia University, and Medgar Evers College. She has worked with Shekere Dance Troupe, Sewee African Dance, Kowteff African Dance Company, Bambara Drum and Dance Ensemble. Currently, she dances with Harambee Dance Company and Afaliah Tribune/ SoulRebel Dance. Kendra Ross is a dancer, teaching artist, and choreographer from Detroit, MI. She started her dance career as a young Afro-Cuban folklore dancer with Danys ‘La Mora’ Perez, with whom she later danced as a guest artist with her New York based company Oyu Oro. Ms. Ross received a BFA from Ailey/Fordham University in Dance. Upon graduation, Ms. Ross began sharing her knowledge as a teaching artist in the New York City Public Schools, which she has been doing since 2007. As a dancer in New York City, Kendra has worked with Urban Bush Women, Andrea E. Woods/ Souloworks, Genesis Dance Company, Vissi Dance Theater, and Motion Sickness with Monstah Black. Ms. Ross is currently a company member of Ase Dance Theater Collective, MBDance, and Moving Spirits Dance Company. Kendra also completed a European tour dancing with Adira Amram and DJ KId Koala in Vinyl Vaudville 2.0. Ms. Ross’s work has been presented at the Detroit Performing Arts High School, Joffrey Summer Intensive, halftime performances at Florida A&M University, the off Broadway show 7 Sins, and Museu de Arte in Salvador, Brazil. Vocalist Anita Purcell is an up-and-coming Jazz and R&B artist who is blazing her way onto the NYC scene. Showcasing her powerful vocal range, Ms. Purcell combines a wonderful mix of originals and covers into her intimate set. Originally from Augusta, GA, she has a seasoned, unparalleled sound that blends the soul of a Gospel influenced, Bible-belt, southern charm, with the heart from a legacy of Jazz greats such as Lena Horne, Billie Holiday, and Nina Simone. As an artist, Ms. Purcell has performed with the Davidson GRAMMY Ensemble Sponsored by the Recording Academy, Governor’s Honors Program Jazz Band, Augusta Chorale, Creative Impressions Performing Arts Group, and Columbus State University Orpheus Ball Orchestra. She is taking NYC by storm one gig at a time! Denae Hannah, a native of Fort Worth, Texas, is a comedian, consultant, and the CEO of the dance and comedy collective DNA Comedy. She believes in the power of humor, movement, and fun to create new perspectives, bring healing, and engage difficult topics. She received her B.A. in Drama from Stanford University, M.F.A. in Performance & Choreography from Florida State University, studied at The Ailey School, and currently studies comedy on scholarship at Upright Citizens Brigade and The Peoples Improv Theatre. She is president of Stanford in Entertainment NYC and also leads Winter Writer Friends (WWF), a collective of emerging comedy writers developing original pilots. Ms. Hannah was a 2012 EMERGENYC artist with New York University’s Hemispheric Institute for Performance & Politics, a 2012-2013 Commissioned Artist at Stanford University, a 2013 TEDxStanford performer, and 2014 Laundromat Project Fellow focused on social commentary comedy. Her original dance comedy shows have been performed at NYC SketchFest, SOLOCOM, SPANK, NACHMO, and the Comedy in Dance Festival. Also, she has performed in shows with exciting comedic voices such as Eliot Glazer, Jean Grae, Wyatt Cenac, Sasheer Zamata, and Hari Kondabolu. Ms. Hannah is currently developing her new show Twerking is a Sport for an April 2015 premiere, and is excited to expand her work to include content for TV and digital platforms. Learn more at denaehannah.com and @denaehannah on Instagam and Twitter. Camille A. Brown is a prolific choreographer who has achieved multiple accolades and awards for her daring works. Most recently, Ms. Brown became a 2015 TED Fellow, recognized for her choreography and community engagement. She is also a Bessie Award Winner for her work, Mr. TOL E. RAncE. She is a two-time Princess Grace Award recipient (Choreography & Works in Progress Residency), a two-time recipient of NEFA’s National Dance Project: Production Grant, recipient of the 2014 Joyce Award with DANCE-Cleveland, a Jerome Foundation 50th Anniversary Grant recipient, and a 2014 New York City Center Choreography Fellow. Ms. Brown was also the 2013 recipient of The International Association of Blacks in Dance Founders Award, the Mariam McGlone Emerging Choreographer Award (Wesleyan University), and the 2012 City College of New York Women & Culture Award. Informed by her music background as a clarinetist, she creates choreography that utilizes musical composition as storytelling, investigating the silent space within the measure and filling it with mesmerizing movement. Camille A. Brown’s choreography and dynamic performances have led her to receive a Bessie nomination for Best Performance in her work, The Evolution of a Secured Feminine, and a Best Choreography nomination from the Black Theater Arts Alliance for her debut work set on the Ailey Company, The Groove To Nobody’s Business. Commissions include: Alvin Ailey American Dance Theater, Philadanco, Urban Bush Women, Complexions, Ailey II, Ballet Memphis, and Hubbard Street II, among others. She was the Choreographer for Saverio Palatella’s line, Whole¬garment 3D, for New York Fashion Week in 2008. A graduate of the LaGuardia High School of the Performing Arts, Ms. Brown earned a B.F.A. from the University of North Carolina School of the Arts. From 2001-2007 she was a member of Ronald K. Brown’s Evidence, A Dance Company, and was a guest artist with Rennie Harris’ Puremovement, and Alvin Ailey American Dance Theater (2008 and 2011). Theater credits include: Choreographer of A Streetcar Named Desire (Broadway 2012), The Fortress of Solitude (The Public Theater), Stagger Lee (DTC), William Shakespeare’s A Winter’s Tale (Regional), Jonathan Larson’s tick, tick…BOOM! (City Center Encores! Off-Center), and Marcus Gardley’s THE BOX: A Black Comedy (Regional). Her new work, Black Girl: Linguistic Play, will premiere in Fall 2015 and inspired her new initiative, Black Girl Spectrum. Beatrice Capote (dancer/teaching artist/choreographer) began her dance training at Amaryllis Dance Academy. She then continued her dance training at Alvin Ailey American Dance Center, where she was chosen to perform Wade in the Water from Alvin Ailey’s Revelation repertoire. She was also featured in the book Attitude. Ms. Capote graduated from the University of North Carolina School of the Arts and recently graduated from Montclair State University with a degree in dance education. She has performed with Toni Renee Johnson’s Maverick Dance Experience, David Jackson’s Wells Performance Project, Sita Frederick’s Areytos Performance Works, and Earl Mosley’s Life Dance Company; assisted Matthew Rushing (Alvin Ailey Company Member); and toured with Kyle Abraham/ Abraham.In.Motion. She performed in Central Park for the Shinnyo Lantern Floating for Peace, which was streamed live on ABC news. She choreographed and performed her solo work as the guest artist for ASHA Dance Company, received a grant from the Lower Manhattan Cultural Council, and has her works at the Earl Mosley Institute of the Arts Summer Intensive Program for the past three years. Ms. Capote is on faculty at the Alvin Ailey School, an adjunct professor at Montclair State University, and performs with INSPIRIT, where she serves as the Rehearsal Director. Mora-Amina Parker is a native of San Francisco, CA, and is a graduate from San Francisco School of the Arts. She has had the fortune of performing with various dance companies, such as Savage Jazz Dance Company, Robert Moses’ Kin, Danco’ 2, Dallas Black Dance Theater, Jeanne Ruddy Dance, and Philadanco. During her career, she has had the express pleasure of working with Alonzo King, Jawole Willa Jo Zollar, Ronald K. Brown, Christopher L. Huggins, Fred Benjamin, and Carmen de Lavallade. Along with her passion for dance, Ms. Parker recently became a certified classical Pilates instructor. This is her fourth year working with Camille A. Brown & Dancers. Scott Patterson is a pianist and composer of incomparable talent. Pittsburgh Tribune-Review describes Patterson’s playing as, “a masterly blend of virtuosity, singing style and beautiful voicing.” Patterson studied under Richard Fields at the University of Cincinnati’s College-Conservatory of Music and Phillip Kawin at the Manhattan School of Music (MSM). In 2013, Mr. Patterson served as music director for the Williamstown Theatre Festival’s Fellowship Project, Loving V. Virginia. He also played the role of Chorus in the Forum Theatre’s production of Clementine in the Lower 9 by Dan Dietz and served as the music director. Mr. Patterson’s music can be heard at http://afrohouse.org/. Tracy Wormworth is a world-renowned bass guitarist in the music and television industry. Her career began as a member of the New Wave band The Waitresses, and subsequently toured with Phyllis Hyman, Sting, Roberta Flack, Cyndi Lauper, Joan Osborne, The B-52s, jazz violinist Regina Carter, vocalist extraordinaire Rachelle Farrell, jazz great Wayne Shorter, and many other artists. She has played on recordings by Joan Osborne, The B-52s, The Waitresses, Regina Carter, Lena Horne, Paula Abdul, and others. She has jingle recording credit, appeared in film, and has extensive live (and taped) television and recording experience. She was a member of the house band on The Rosie O’Donnell Show, which aired for six years. She also subbed on The Conan O’Brien Show in the bass chair. She has appeared on The Arsenio Hall Show, The Tonight Show with Jay Leno, Late Night With David Letterman, The Craig Kilborn Show, and The Today Show. Ms. Wormworth is currently playing with The B-52s and has done several world tours with the band. She recorded with the band on The Flintstones soundtrack and on their album Good Stuff. In 2008, she was listed as a full band member on their album Funplex, and is featured in their Live DVD With The Wild Crowd, released in 2012. Robert Mcintyre (Production Stage Manager) is originally from Scranton, PA. He attended East Stroudsburg University of Pennsylvania for Business Management and Technical Theatre. Since then, he has been working all over the northeast region in PA, MA, upstate NY, and NYC freelancing in theatre and dance. Robert has interned at Williamstown Theatre Festival and Jacob's Pillow Dance Festival. He returned to Jacob’s Pillow this past summer as their Inside/Out Production Coordinator.